In Lo Cascio 1999, I described similarities and differences between narration and argumentation. My standpoint was that both types of systems show similar constructions and that they can often be considered two aspects or faces of the same medal. In this paper I want to highlight some new aspects of the parallelism. Narration is characterized by two main categories: Event (E) and Situation (S). The difference between the two categories is an aspectual one, and not a temporal one. Events are states of affairs presented by utterances where the verb is marked by perfective tenses. This means that events are states of affairs presented as closed time intervals. Therefore they have a starting point and an end point. It was very warm (S1) and she went out to buy an ice cream (E1). Then she saw John (E2) going to the station (S2). He was carrying a big suitcase (S3)”. Where, S1 and S2 are open time intervals. E1 takes place within the time interval R0 and delivers the starting point for R1. E2 takes place within R1 and delivers R2, and so on. States of affairs can also be presented as in progress (he was going to the station). In that case they are marked by an imperfective morpheme and are considered as situations, i.e. open time intervals. Situations can also be presented through utterances, which are marked by past perfect tense, as the first sentence in (3) shows. In (3) the event R had been told (i.e. a state of affairs represented as closed time interval) is presented as starting point. That event has taken place previously in the same world but it originated a situation, which is of influence at the time interval during which the event E1 takes place. Let us now have a look at the structure of example (3) in order to see how the temporal chain is formed and how the story moves forward. In the story (3), E2 (he took a table) takes place after E1 (went into Montana bar) has been accomplished. E1 therefore delivers the reference time for E2, i.e. the time interval where E2 can take place. The reference time R1 begins an instant after E1 has been accomplished (cf. Partee 1984, Lo Cascio 1982, 1995b). E3 follows E2. E2 creates therefore the reference time R2 and delivers the conditions, which allow that E3 takes place. An event or situation can take place in a world W or belong to a world W at the condition that it is in harmony and coherent with the already existing states of affairs and characteristics of that world. So, an event such as: to go out to have an ice cream can be more congruent with a world where at time the situation “it is warm” holds , while less congruent in the same world, would have been, for instance, the event: he switched on the central heating. In (3) the first utterance defines, as already said, the preliminary conditions needed to understand why the character is going to the bar Montana on May 2. The event (R be told) is presented as something which already happened, forms a background-story characterizing the world in such a way that the rest can happen. As such, that event forms the starting point of the story. Every event or situation, as a matter of fact, delivers the conditions or bases, which are needed in a specific world in order to understand and make possible that a new event comes to change that world. A chain of events and situations forms a story. Situations describe the world and are the background of it, while events change that world. Temporally ordered clauses are narrative clauses. A sequence of at least two narrative clauses forms, according to Labov (1972:60), a minimal narrative text. Labov, nevertheless, doesn’t make a distinction between situations and events, although, according to me, the difference is crucial. In narration, and in general, in communication, another crucial distinction is the one between foreground and background information. Space information, characteristics and properties of the spaces or traits of participants form the background information. They play a role either in determining whether a given event or situation fits with that world, or in guessing which will be the development of the story. 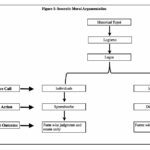 Descriptions and situations are, according to Reinhart (1985:783), non-narrative, non-temporal material and therefore cannot be foreground information but background information. Foreground information is only formed by temporal material, i.e. by events. The distinction between states and events is then, according to Reinhart, equal to the difference between (informative) background and foreground information. The aspectual opposition makes evident the distinction. Background information provides the conditions to understand and to admit the existence of the states of affairs presented in the foreground. It is so to say the support for the foreground, since it presents characteristics, conditions, open time intervals created as result of events which have taken place previously: all elements which justify the existence of the information in the foreground. After events have taken place, they change the world and create as a result, a new situation, which is determinant , within the new reference time, for which new specific event or situation can take place. The events changing into situation in the world become, so to say, part of the memory of that world where they have left a trace. This is a semantic and cognitive mechanism, which has a lot of consequences by the construction of knowledge and texts. As consequence of this mechanism, every time that the specific congruency principle, which previously applied, must in turn be either readapted, or restricted, or enlarged according to the new changes and situations. So the event “(he) took a table in the rear” is possible in a world where previously another event, namely “he went into the bar Montana”, took place. Narration is to put together events and situations on a time-axis and to bind them by temporal relationship. Moving the story forward means to change constantly an initial world defined through the temporal relationship established with a perspective temporal point, which has been chosen by the speaker and is given for the addressee. I called (in Lo Cascio 1982) this perspective temporal point, the Given Primary Time (GPT). The GPT can be the time interval related to NOW (which means a deictic relationship). But it can also be delivered by other time intervals established by the encoder: the moment of narration, the time of the author, the time of a protagonist, the time of the reader, etc. In order for the addressee to be able to interpret the message, he must know which perspective point has been chosen for the temporal calculation. The Given Primary Time dominates and controls the temporal axis where events and situations are anchored or are going to be anchored and bound to each other in order to form a story. Events in stories are basic. Their temporal succession forms the dynamic part of the story. Situations on the contrary are the static part of it and characterize the world to which an event or a set of events, which are part of a story, belong. Situations, since they are considered open time intervals, are not able to let the story move forward. They form, so to say, the memory of the world to which they belong. Before an event is allowed to take place, shifting the story forward on the temporal axis, the preceding event, which is anchored on the same temporal axis, must have come to an end. Every event can also be the point of departure, the head of a sub-story. A sub-story is then a kind of secondary information for an event or situation, which is placed on a higher level. The sub story is a background information, reinforces the acceptability of new events or situations, and allows a further selection of them in the same world. Moving the story forward brings about the changing of the actual world into a new one whereto a new event is added. The new event belongs to the possible sets of events or situations, which are allowed to take place in that specific world. The story makes a choice between all the possible candidates. According to my analysis, in narration, every event, after having taken place and having created a reference time (or world), becomes a background information for another new event, which will be added to the same time axis and anchored within that reference time. It could be said, in cognitive terms, that our knowledge is , in this way, built up as a form of addition, of a piling up. It is well known that an addressee (reader or listener) at every stage of the story can imagine or guess which events or situations are going to take place, choosing between all those which are allowed according the congruency principle (cf. Lo Cascio 1997). The set of possible states of affairs, which can belong to a specific world, is part of the encyclopedic knowledge of each speaker, but the set changes, in entity and quality, according the specific knowledge a speaker has. Nevertheless, in the reality the encoder makes often a different choice than the decoder, so that it is frequently a surprise for the reader, or the listener, the way a story continues and develops. This is the nice play in the interaction between encoder and decoder(s). Background information can be hidden or remain implicit. It can be the task of the decoder to reconstruct, to guess which is, or could be, the needed background information, in order the event, or set of events, presented, can be considered possible, adequate, acceptable, and congruent with the world in which they show up. The reconstruction of information, which, although lacking, should justify the existence of the events narrated, or, mutatis mutandis, justify the standpoints proposed by the encoder, must be made in accordance with the congruency principles. In the reconstruction procedure, the main guide is thus the congruency principle, with the help, for argumentative text, of the general rule, the warrant, which makes possible and justifies that a specific argumentative relationship holds. I think that day she went out for an ice cream (E) because it was very hot (S). 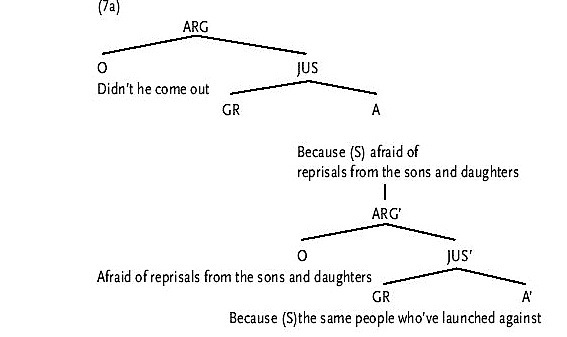 Two possible interpretations can be assigned to the sentence. The event he went out is true; the situation it was hot is true and the relationship of cause and effect between the two components is questioned. (1a) contains then, an argumentation, since a refutable claim is made about the relationship between the two states of affairs in the specific situation and at that specific time. But (4) could refer to another type of reasoning, namely that the state of affairs (event) he went out for an ice cream has the status of a standpoint, of a refutable claim or hypothesis. The event could have taken place (although not sure) because triggered, at some time, by the state of affairs (or situation) it is hot, which is given as true. The situations characterize as already said the world where at a given time an event takes place. The description of the situations characterizing that world can function as “justification” or “data”, supporting the possibility that a relationship happens to be true, But it can instead be a support for a standpoint or for a claim according which a specific event will happen. The fact that there is at a given time interval a world where the state of affairs it is hot holds, creates the conditions for, or makes plausible the statement that the event “ she went out for a ice-cream” also holds or can be guessed to take place. So, if a standpoint, or a set of data related to that standpoint, can be questioned, then reasoning is involved. The epistemic modality changes narration into argumentation! According to Lo Cascio (1991a, 1991b), at least three categories are always needed in order to have an argumentation: the standpoint or opinion (O), the argument (A) and the general rule (GR), which binds the argument to the standpoint. The general rule GR and the Argument A form together the Justification (JUS). Both, the standpoint (O) and the argument (A), refer to states of affairs, which can have the status of event and situations. The general rule defines the congruency principle for argumentation. Every state of affairs presented as argument A requires and triggers its own GR in order to be relevant for the standpoint, which must be justified. A statement, which can be questioned, forms then the main part of reasoning. The statement must be accompanied at least by one justification in order to form an argumentation. The justification must be explicit or recoverable from the (con)text, and has the function to present data, which can make plausible that the connected standpoint is valid. where JUS, contains all the conditions for O to be true. How old was she? It was the first question Colonel Roux asked himself when he received the summons to meet her, As an examining magistrate she must be a woman of a certain age.[ARG]. But there was always the curiosity if one was to work with a woman. Madame Annemarie Levi. An Italian name. As it will be clear, (6) contains reasoning. There is uncertainty about the age of a certain woman and the guess is made that the woman in question must be of a certain age because she is an examining magistrate (which is a given fact, a situation or a characteristic of that world). This fact could imply the existence of another state of affairs, namely the situation: the woman is old. The implication is triggered by a warrant of the type: “to become examining magistrate takes a long time”. Those who have reached that position, are then old persons. ´That’s the angle that interests me. How could they persuade the President of the Republic to sign a pardon for a thug like Brossard? And they almost got away with it. In fact, if this new charge hadn’t been laid against him we wouldn’t be able to touch him now. ” You are right, madame. That changed things. Of course, he’d have been freed in any case, when the statute of limitations for wartime crimes ran out five years ago, The question is why didn’t he come out of hiding then [O].? In (7) the question: Why didn’t he come out of hiding then, concerns an event/situation having also the function of a standpoint (O), and which could have been caused by the event or situation he was afraid, which in turn functions as justification (JUS) in the argumentation. (7), gets the value of argumentation due to the presence of the epistemic modal “I suspect”. In (7) the standpoint (O) operates on an event (it didn’t come out), which has already taken place and is considered true. The argumentation contains the definition of the possible reasons or causes for the existence of that event. The hypothesis is made, or the justification is proposed, that the event in question has been caused by the fear of reprisals, a standpoint, which is in turn justified by the fact/situation that it concerns the same people who’ve already launched a charge of crime against him. (7a) shows that the sub-justification (ARG’) is a further support for the higher justification and refers to states of affairs, which have already happened and are now to be considered situations, part of that world and of relevant influence for it. The same complex configuration holds for narration, where the embedded stories have also the same function of background information. In every story or argumentation, secondary stories or secondary argumentation, can be embedded into a higher one, with the aim to give more details about the world at stake and to state the truth-value. Not all information is always needed. A lot of information remains therefore implicit or not mentioned. It is the task of the decoder to imagine and reconstruct the missing information. Many writers (and encoders) are sparing n giving details. Others on the contrary abound in it. – Argumentation requires that the truth or status of at least one of the components (standpoint, justification) or the relationship between them can be questioned. – Both types of texts presume that general rules regulate the binding between the components. The movement forward of the story and the relationship between standpoint and justification are regulated by a general rule which is respectively the congruency principle and (in the case of argumentation) the so-called warrant (in Lo Cascio’s lexicon the General Rule). – Both, narration and argumentation need the description of the world in order to state the truth-value of their components or of the relationship between their components. – There is an analogy between, on one side the dichotomy event-situation, and on the other side the dichotomy standpoint-argument. (E equal to O and S equal to A).The difference is, that while a story requires at least two events temporally connected to each other, aside from the explicit presence and mentioning of situations, in argumentation, standpoint and argument must both be explicit or recoverable, independently of the fact that they operate on events or on situations. – Argumentation is dominated by the sequential order of the two categories: standpoint-justification. – If reasoning presents both standpoint and data, as true, then a statement is being made about the relationship of the type cause-effect, more than a real argumentation. – The relationship between the two main components of argumentation is regulated by the general principle, the warrant. The general rule must be acceptable for both the encoder and the addressee, in order for the argumentation to be successful(i). – Notice that if we try to change the reasoning in (6) into a story, then two situations would be related to each other. Cf. : The woman was a magistrate and she was old. But two descriptions, which are congruent, do not yet form a story, because an event is lacking. This would mean that an argumentation could benot only the modal counterpart of a story (which would require an event) but also a counterpart of the description of at least two possible congruent situations in the same world, or story. – Concluding, argumentation concerns a world where some situations are given as true and an hypothesis is made about which possible event or situation can take place or could hold, according a given congruency principle or a general rule. – The relevance of the dichotomy background – foreground seems to me evident, also for argumentative texts. In the background information are gathered all the states of affairs which can support and justify a standpoint. The standpoint should form the foreground information. The Justification is then the background information. The two components are connected by the general rule and by the congruency principles. 4. Interaction between narration and argumentation. From the point of view of the rhetorical interrelation between the two types of texts, narration is often used to give more support to the argumentation, since it concerns states of affairs, which are given, or considered, as true. This is supported by the fact that narration is always marked by the temporal modality, which helps to define the truth-value of the states of affairs. “Dad went to say something, and I knew he was going to ask what had happened to me, so I motioned to him not to and he sat down. What a moment it must have been for him [O]. I’d broken his heart so many times in the past by getting into trouble [JUS1]. Now here he was, a man who had given years of devoted service to the British Army facing a son accused of such an atrocious crime against the system he had proudly upheld [JUS2]. He had brought his family away from Belfast to leave the bitterness and hatred there behind [JUS3] He and mum had worked hard to bring up a big family as best they could [JUS4]. And it had come to this. Paddy Joe Hill Forever lost, forever gone p.101. In (8) narration and argumentation are interacting: the prisoner argues about the sorry his father must have felt, a father who sees the son arrested and incriminated for terrorism. A father who was so devoted to the state and who had served the army. All the narrated facts, events or situations, form actually in (8) the reason and the justification for concluding that the father must have felt a lot of pain. All three narrated events, which took place in the past form now the characteristics of the world, i.e., the situations which justify and cause now that the event/situation/ standpoint “father is sad” takes place and is true. 4b. That day, I think, she went out for an ice cream, [-] it was very hot. In a detective story or a crime story, reasoning and argumentation are central. A detective story is based on a reasoning in order to discover the culprit and to understand how things passed, by analyzing the facts and data at disposal. In general, the play of the writer consists in requiring the participation of the reader/listener to the detection of the culprit. But the reader will come to the wrong conclusion not because he will make logical mistakes or apply wrong warrants, but because he lacks a relevant information, which is known only by the writer and which is hidden, and only given at the end of the story. The only one who has the right to reach the truth is then the writer or the encoder/or protagonist. The textual form, which is preferred in argumentative stories, is often a dialogue. Dialogue can be the place of an interactive argumentation. The way a dialogue proceeds is an instance of all the possible paths, which can be followed by each step in the discussion. In this way, argumentation as well as narration, become critical but also creative. Every turn in the discussion is a changing in the world in the way the congruency principle would admit. The choice of which path must be followed, or will be followed, among those allowed by the congruency principle is on the specific participant who takes the turn over. This participant establishes the path to be followed until the other discussant will take it over. The latter then has the right to privilege another path or to remain on the same one the other discussant had proposed. One of the strangest witnesses of the case was a chap called Tom Watt, whose damming testimony was aimed mainly at John Walker, but by implication was bad for all of us [STANDPOINT], Watt lived in Alum Rock, Birmingham, and worked in the same factory as John, Richard, and Murray [the other three incriminated] He said that he knew they were IRA sympathizers and that John had been on an IRA training session in Ireland [JUS1]. He claimed John had often told him not to go out on particular nights, and on each occasion bombs had gone off round the city [JUS2]. On the Thursday of the pub bombings, he said, John had told him: “Don’t be going out for a drink tonight” [JUS4]. He said John had been very bitter at McDade’s death, and shortly after it had asked Watt if he knew where he could get some cheap alarm clocks, Watt said he had told John “I thought you usually used pocket watches”, and John had replied, “These are going to be big bastards”. [JUS5]. All in all it was pretty devastating testimony which must have had enormous influence on the jury [STANDPOINT]. It was because of the importance of the so-called confessions in our case that within a short time of the trial opening the judge dismissed the jury for eight days to hold a “trial within a trial” to determine whether or not they could be admitted as evidence. The mini-trial was a straightforward affair/ Either we were lying or the police were. There was no middle ground. Our problem was that we had no evidence to show the liars were the police. Nearly all the medical evidence was unsatisfactory because it was difficult to differentiate between the injuries we Had received from the police and those inflicted at Winson Green. In (9) the message to the reader would be that the truth may often not be discovered and that the facts are manipulated. It is of course a pessimistic view of the world but sometimes a realistic one. There are many situations and stories in the real or in the fictional world in which the truth doesn’t show up or is not allowed winning. [i] It would be interesting to define the differences between a congruency principle holding in a narration and the warrant regulating the argumentation. The more is interesting since argumentation and narration are very often interrelated into the same text. Eemeren, F. van, R. Grootendorst, F. Snoeck Henkemans (eds) (1996) Fundamentals of Historical Backgrounds and Contemporary Developments Mahavah, Lawrence Erlbaum Associates, Publishers. Kamp, H. & C. Rohrer (1981) Tense in texts. In R. Bäuerle & C.Schwarz & A.V. Stechow (eds): Meaning, use and interpretation of language Berlin: 250-269. Labov , W. (1972) The transformation of experience in narrative syntax. In: Language in the Inner City Philadelphia, University of Pennsylvania Press. Lo Cascio, V. (1991b) Grammatica dell’argomentare: profili strutture strategie Firenze, La Nuova Italia pp. 448, Spanish translation, Gramatic­a de l’argumentación, Madrid, Alianza Edítorial. Lo Cascio, V. (1995b) The relation between tense and aspect in Romance and other languages. In: P.M. Bertinetto, V. Bianchi, J. Hig­gbont­ham, M. Scar­tini (eds) Temporal reference, Aspect and Actiona­lity Torino ‑Rosemberg ‑ Sellier, pp. Lo Cascio, V.(1995c) Aspetti retorico‑argomentativi nella narrativa contempo­ranea. In: S.Vanvolsem, F. Musarra, B. van den Bossche (eds) Gli spazi della diversità Roma‑Leuven, Bulzo­ni‑Leuven University Press, pp. 211‑242. Lo Cascio, V. (1997) L’ascoltatore nel labirinto narrativo. In: D. Aristodemo, C. Maader & R. De Rooy (eds.) Studi di teoria e storia letteraria Firenze, Cesati 51‑69. Lo Cascio, V. (1999) Narration and Argumentation: a Rhetorical strategy. In: E. Rigott (ed) Retoric and Argumentation Tubingen 1999, Max Niemeyer Verlag pp. 13-38. 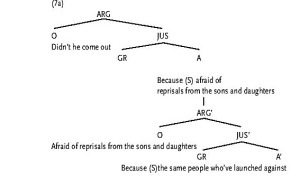 Lo Cascio V. & C. Vet eds, (1986) Temporal structure in sentence and discourse; GRASS 5 ‑ Foris Pu­b­lica­tions‑D­ordr­echt. ISSA Proceedings 2006 – The Definition And The Negotiation Of The Norms Of Discussion In Newsgroups: Which Communication Ideal? ISSA Proceedings 2002 – Argumentation’s Black Box?